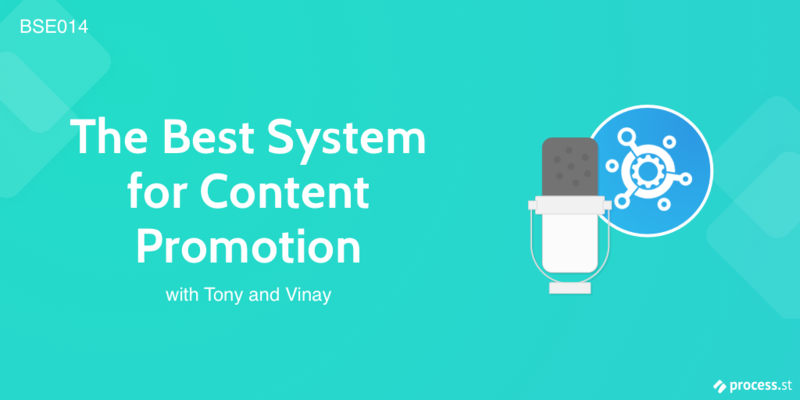 In this episode of the Business Systems Explored podcast, Tony Brown the author of Standard Procedure and Vinay Patankar from Process Street, have an in-depth discussion about the most effective content promotion methods for their businesses. You can spend as much time as you like creating content, but it’s a massive waste of time if you aren’t promoting it. It’s not 1999. You can’t artificially game search engines to get huge visibility or spam newsletters to push your content out to thousands of people. You can’t even hope to get discovered organically if you don’t already have a following. And that’s the problem we’re trying to solve in this podcast. In this episode, we run through every promotion tactic that’s helped build Process Street to a blog that gets over 100,000 monthly pageviews, and ranked highly for some of the more competitive keywords in our niche. Discover the ‘silver bullet’ we swear by, and the tactic that has spiked our traffic by over 15,000 in a single day. Did you know there is actually a way to use social sites to generate traffic as consistently as organic methods? Find out all about that and more in this week’s episode. Our content promotion process — what happens after you hit publish? Can syndication hurt your SEO?